This 10 Gang Universal Tin-Plated Bar is designed to accommodate up to (10) Arrestor IS-B50 Series Bulkhead Style Impulse Suppressors or SO239 Bulkheads. Arrestors are used in surge protection design to protect HF, VHF & UHF antenna applications. The standoff insulators are made from fiberglass-reinforced thermo-set polyester with higher moisture, heat tolerance, and mechanical strength, making more suitable for ground bar and perimeter grounding applications. This kit is recommended for large scale designs. Surge protection is required for all tower and antenna designs. 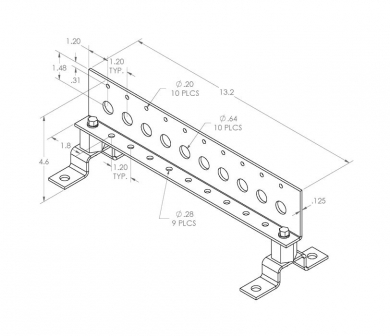 These ground bars are specifically made to accommodate arrestor and bulkhead accessories, with ten gangs installing many arrestors or bulkheads is simple and quick. Ideal for large surge protection networks .Tin plating prevents corrosion for outdoor applications.